I've always been fascinated by watches: they may be small devices, but they have all the components to mechanically keep the time without electrical reliance (in the case of mechanical watches, at least). At a recent Mini Maker Faire in the East Bay, I came across Compass Rose Design, which had small $6 packets of watch parts for people to buy and design with. When busing home with my loot of small, broken mechanical watches, I decided to stop at the East Bay Depot for Creative Reuse and of course, what would I leave with except another couple of larger broken watches (some quartz watches as opposed to mechanical ones in this batch). It was my chance to open up watches to understand the inner workings, but admittedly I was a bit skeptical to start: I've seen the expansive set of tools at watch repair shops, and at best I merely had a standard set of screwdrivers. The first watch I opened was a test run, and it was surprisingly simple. Because I didn't have to worry about damaging the parts, unlike someone repairing a watch, I really didn't need the specialized hands remover: just tweezers, 1/16" screwdriver, and a small blade were enough. I also didn't need to worry about jewels as much as I though I'd need to, which greatly simplified things. However, three tools might not be enough for all watches, as some are more complex and secured compared to others. I had relatively cheap watches with simple movements, so these three sufficed. Another thing to note is that more advanced tools would be needed to *properly* take a watch apart (properly as in the watch could be put back together with full function without any damage). For example, if you have a waterproof watch, the case will be extra tight to prevent water damage, and thus opening it will be much harder -- I had an old Guess watch that I really wanted to open, but it's supposedly waterproof and thus that much more difficult to open. Another example is with the hands: the hands should be removed with a hand pulling tool to avoid scratching the dial or damaging the hands. You'll also want some sort of organizer to separate all of your parts. I just used a cheap pill box container. Don't forget any extra things you might want for making things with these watch parts! The main thing would be glue: regular superglue like Loctite works all right, but for permanence you'll probably want a metal epoxy (but so messy D:) or E6000, which is usually the go-to glue for jewelry-type metal-to-metal bonding. Because I recently got my ears pierced (went from zero to five holes in my ears in within the first month of 2017... I can tell that this year is going to be interesting already), I wanted to build some gear-earrings and thus got E6000 and earring posts (courtesy of Valentines' Day sales..). So what are you getting into, reading this tutorial? Well, I did a bit of research into watches and how they're made, so my typed up, compiled notes are in steps 3 and 4. Step 3 walks through the basics of the different types: manual, automatic, and quartz movements. Then step 4 explains how quartz watches work compared to mechanical ones, which rely on no battery. Steps 5-10 are a slow overview of disassembling a simple Timex mechanical movement, encapsulating the basic "what to expect" components (gear trains, crown + stem, escapement, mainspring, balance bridge). Then the next 6 watches are done in a single step each, with notes in pictures explaining what's going on. Step 11 is another Timex watch, just to show another view of the same movement the watch was circular instead of rectangular, but the internal movement was just the same!). Step 12 is a Swank watch; another mechanical watch with the same major components but this time they are positioned differently in the movement. Step 13 is a Medana watch; again, mechanical watch with similar components in different positions. Additionally, the watch dial is held on with tiny screws instead of small folded prongs or tension springs. Step 14 is a Hamilton watch. This one is special in that it has 17 jewels throughout the movement for addressing wear and friction. Step 15 is another Timex watch, but this time it has a quartz movement. There's a classic green PCB to make this obvious, and the metal gear trains that we typically see have been replaced by plastic ones (even metal screws are replaced with rubber fasteners). Step 16 is another quartz watch (Armitron). More metal gears than the Timex quartz movement, and of course in different positions too. Step 18: a brief conclusion. Watches contain movements that consist of all the gears and miscellaneous parts that make watches "tick." These movements come in three main categories: manual, automatic, and quartz. Manual and automatic movements are mechanical, meaning that they rely only on gears and springs. Automatic movements are powered by your wrist's motions, which power an oscillating rotor that transmits energy to the mainspring. Manual movements are powered by actively winding up the mainspring via the crown. On the other hand, quartz movements require batteries to power an electrical circuit in addition to mechanical components. Quartz movements are comparatively more accurate, inexpensive, and wide-spread, accounting for over 90% of watches, but mechanical watches are prized for their accumulation of ~600 years of craftsmanship. There are other classifications, such as Swiss movements as opposed to Japanese ones, but the main point is that not all watches are created equal! More info can be found here and here. Now, how can you go about telling the watch movements apart? Quartz movements will be the easiest the pick out, as they'll contain a battery and fewer mechanical parts. Also, if you get to see the watch in action, the seconds hand of a quartz watch generally sweeps in discreet ticks, whereas a mechanical watch will have a continuous sweep. As for how to tell a manual vs. automatic movement... I honestly couldn't find a definitive answer online -- but if anyone else knows, I'm very curious so please let me know (see edit)! edit (2/18/17):Thanks to KolijahC for explaining: Generally, automatic watches will have a weighted gear on one side that spins as you move it, winding the movement for you (see second image above). Solar watches are considered automatic as well, but those are more modern. Now that we know about the different manual/automatic/quartz movements, what are the components that make them work? Quartz movements rely on the piezoelectric effect: when a quartz crystal is electrified, it vibrates at a particular frequency (32768 times per second). Because this is just 2^15 times per second, it's easy to convert that vibration frequency into what we call a second. The electrical impulses are sent to a stepper motor, which sends every 32768th pulse to the dial train that controls the minutes/hours hands. These movements have much fewer components than mechanical movements, since the major thing in common is the dial train; everything else can mostly be controlled by the electrical circuit. See this image for a good exploded view of how these different parts mesh together. 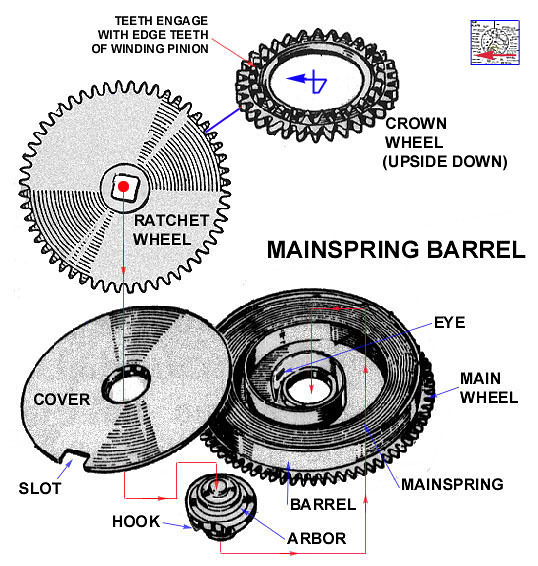 First, turning the crown provides potential energy that is stored in the mainspring. The mainspring barrel that houses this then spins a gear train that scales up the speed from mainspring rotation, as the energy is transmitted toward the escapement. The escapement oscillates to release this raw energy in regular rhythms, turning the hours and minutes hands only after a certain number of beats. 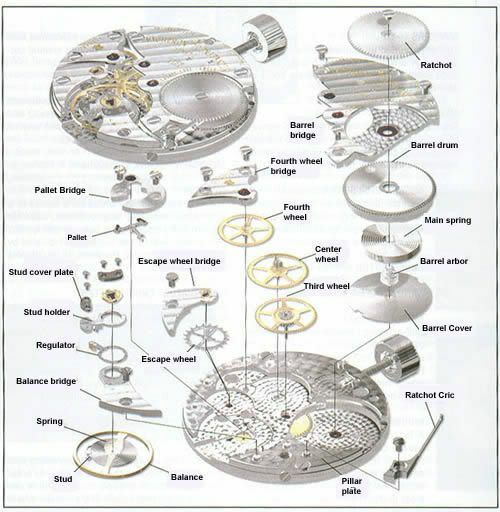 Here's a nice picture showing an exploded view of a watch with the components, and here's another one with good vocab too. And without further ado, let's get down to business. This watch is a small mechanical one made by Timex. I had three small Timex watches, and the movements were actually all the same once I disassembled them. The movement of a watch is enclosed in a case for protection. The back of the case usually has a slight ledge to provide purchase for levering it up and off. Sometimes fingernails will suffice, but more often you'll need to run a sharp edge along the crevice underneath the back to gently wiggle it off. Be VERY careful with sharp blades, and make sure you know where your fingers are at all times! If you're worried about using that, try using a screwdriver (or awl if you have one). In older watch movements, there may be case retaining screws that need to be removed before the movement can be accessed. I didn't encounter any, but just keep this in mind if the back isn't coming off no matter what you try. edit (2/18/17): Thanks to NomadHobbyist for sharing: You can use a pair of needle nose pliers to open a screw off case back like the one shown in the fifth picture above. You have to pinch the opposite notches and unscrew it. Take care of the watch dial first. Usually they have little feet/prongs that keep them in place (see third picture above) so flip the movement over to find them. Then simply pry up the prongs to release the watch dial. The dial will have an hour wheel and cannon pinion attached, along with the hands. Just gently pry up the hour wheel to release everything, since the hands are usually fastened by pressure fit along with a thin washer. Do this with the hands facing your table though, as they'll want to fly away. There are specialized instruments to safely remove the hands (aptly called a hands remover), but again: for disassembly, I simply want to harvest the gears and components and don't care about putting the watch back together again. All right: the beginning of removing screws. When removing screws, use either the screwdriver or small blade. The edge of the small blade can be used for screws whose grooves are too thin for your screwdriver to fit. Then use tweezers in small tight places where needed. With the watch dial taken care of, I turned my attention to the rest of the watch movement and looked for the most easily accessible screws to remove. This happened to be the ones next to the balance wheel, so I used my screwdriver or sharp blade to remove them. The balance wheel is actually kept in place by a balance bridge that the balance spring is attached to. Unfortunately for me, there was a final screw keeping the balance bridge in place, but my screwdriver wasn't a good fit (and it was inset so my blade couldn't access the groove). Thus, I resorted to snapping off the spring to remove the wheel. There should be a small screw next to the crown and stem. Once you remove it, you'll be able to detach the crown from the rest of the movement, along with adjacent parts (stem, click, washer, crown wheel). This crown wheel is the one that engages with the mainspring barrel to transmit energy from the crown to the mainspring. The two main plates of the movement should now separate since all screws are loose (or if not, look around for more screws to release). The escapement components (forked level, escape wheel) should become loosened, along with the gear train (third, fourth, and central wheels) -- see here for a good exploded view of what's happening. The escape wheel turns the fourth wheel, which turns the center wheel, which turns the third wheel. Another piece you'll notice is the mainspring barrel, which houses the mainspring (thick coiled spring). Be VERY careful handling this, as the mainspring stores a lot of potential energy that will lash out if you loosen it from the barrel. Carefully use your fingers to remove the mainspring and let it unwind slowly (maybe turn your head, in case it pops up at your eyes...). At the center of the coiled spring will be a small component called the central arbor, which you can remove by using fingers/tweezers to loosen the center coil. Look around for more screws to remove, but otherwise that was it for me! The finishing touch was simply removing the small wire springs on the two main faces of the movement (first image above). The second image above displays all the parts with labels so you can have a bird's eye view of everything. This was yet another Timex watch, but it was round instead of rectangular as seen previously. Even so, the movement inside was exactly the same; just the dial was different to account for the watch shape. See the notes in the step by step instructions below for disassembly and watch part labeling, but the components are exactly the same as for watch #1. This round movement was from a brand named Swank. The movement had significant positional differences from the Timex movements, but the major components (mainspring, balance spring, escapement) were all present and looked similar. Notably, I finally managed to remove a balance spring in one full piece! See the notes in the step by step instructions below for disassembly and watch part labeling. This movement came in the bag without a watch dial or balance bridge (or forked lever + pallets), and what caught my eye were all the jewels! Again, jewels in mechanical watches are for reducing wear in the movement in high friction areas because they are a) hard enough that they're difficult to wear down and b) smooth to allow for easy sliding. The jewels of choice were usually rubies because they had hardness properties similar to those of diamonds with a relatively smaller price tag (key word here is "relatively" -- cheap only compared to diamonds). Engraved on this watch movement is the info that it has 17 jewels. Back when real rubies were used for these purposes, having more jewels in your watch was a status symbol because it meant your watch was significantly more expensive. Even so, having more jewels isn't always a good thing, especially as they can be dangerously redundant in some areas. As this site says (good info on jewel background, by the way), "Jewels are added to make it easier to create a high grade watch, but adding jewels alone will not make a watch high grade and many high grade watches do not have lots of jewels." Now that watches use synthetic rubies, having more jewels won't even make anyone break the bank and thus number has little meaning here. You can technically remove and replace jewels, but I don't have the special equipment for that job and thus didn't bother with that. It's interesting that positionally, the main architecture inside the movement was relatively similar to the Timex movements from before. Unlike the previous mechanical watches, this watch has a quartz movement so the key components we've seen before will be missing, having been replaced by the electronics. Even though this is a Timex watch, the components here look almost nothing like what we've seen in the Timex mechanical watches. See this picture for a nice exploded view of what to roughly expect. Notably here, the typical metal screws have been replaced with little rubbery stoppers that are fairly easy to pop off (cheaper, perhaps?). Also, there's the green circuit board that's behind all the electronics. Here's yet another quartz watch (Armitron). This one didn't have any of the rubber stops that I saw in the Timex movement, interestingly enough -- instead, it had metal screws. I originally thought that maybe the rubber was to replace the metal screws that might negatively interfere with the circuitry, but I guess not. This quart watch differs from the Timex one in the positioning, of course, but also the circuitry -- notice that the glaringly green PCB is gone? It's been replaced with a brown version.. plus a nice big oscillating quartz crystal is present here. Because I recently got my ears pierced (went from zero to five holes in my ears in within the first month of 2017...), I wanted to build some gear-earrings. I selected two similar mainspring barrels from my collection to fill with gears. The gears were from the crown wheel gear trains, since the main gear train usually had pins though the middle that I couldn't remove. I used E6000 to glue everything together for its strength, but it was also quite messy sometimes. Use a toothpick for application for that reason: squeeze a small drop on scrap surface and use the toothpick as a brush to apply the glue where you need it. Make sculptures (better if you have bigger watches' gears, since smaller ones don't have much substance to them. Reassemble a Frankenstein watch with different parts from different watches? Not sure if everything would mesh well together, but it'd be an interesting challenge. As always, feel free to leave any questions or comments, and I'll be sure to get back to you when I can. Enjoy! i think the eatings are great! your heart would make and incredible pendant. some watch dials require you to back out tiny screws that are accessible from the sides. Also, removing the hands first with a hand pulling tool would help if you were actually repairing the watch. Nothing too difficult about watch repair, just getting parts is a hassle as most of the parts are not available to be purchased by third parties. Oh, thank you for the tip on the tiny screws. On those old women's watches the balance staff is easily damaged or the hair spring could become easily bent. Other than that there are enough of them made that you could probably still buy a few and scavenge parts until you get it working. Problem with those watches was they had no shock resistance and the cases were barely made to keep dust out. Small screws indeed! That's why the flat head screwdriver had to be ~sixteenth inch. How cool - When I was in Houston, I asked a jeweler what he did with broken watches - he gave me a whole bag full - free Neat stuff inside. I'm using parts for steampunk. Generally, automatic watches will have a weighted gear on one side that spins as you move it, winding the movement for you. Solar watches are considered automatic as well, but those are more modern. Just FYI, if you are willing to wait a month for shipping, you can get a full set of tools on ebay for less than ten bucks. I see, good to know. Thanks for the info on ebay watch repair kits! You can use a pair of needle nose pliers to open a screw off case back like this. You have to pinch the opposite notches and unscrew it. Figured this would be a useful tip to add. Ah thank you for your input!